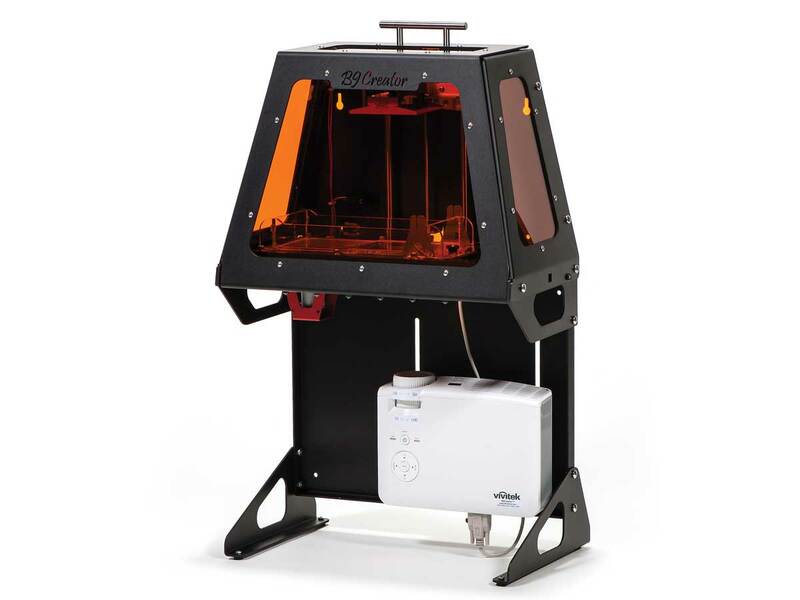 With over $800,000 in funding from two Kickstarter campaigns, B9’s Michael Joyce has created a well-built resin-based 3D printer using anodized aluminum parts and an off-the-shelf DLP projector. Providing exquisite detail capabilities, this open-source machine has been adopted largely by jewelers to print rings for lost-wax castings. Setting up the Creator requires manual calibration, but the video walkthroughs of the hardware and software are very clear. You’ll need to level the print bed with the silicone layer of the resin vat and focus the projector to your desired resolution. The software’s bed leveling and projector calibration wizard walks you through these tasks. It took us about 15 minutes to dial it in at 50 microns, the B9’s finest x-y resolution. The software gives you a lot of print setup options: You can manually attach support structures anywhere on the part, adjust layer exposure times, and tweak firmware settings to support different-sized projectors. The x-y build area varies according to the layer resolution you choose: 50 micron, 2″×1-1/2″; 75 micron, 3″×2-1/4″; or 100 micron, 4″×3″. The lack of automatic support generation is a drawback, especially if you’re printing complex or overhanging shapes. The Creator does not come with finishing tools, but it does have a parts list of gear to buy. We recommend getting a sealable tub to bathe your prints, like the one that comes with the Form 1, preferably large enough to soak the build table. In testing, we used the 50.8-micron layer setting. Layers of the print were still faintly visible on curved edges, but both vertical and horizontal flat sides looked completely smooth. The logos on the MAKE robot were very sharp, with only tiny steps on the tapered surfaces — still vastly better than an FFF machine. 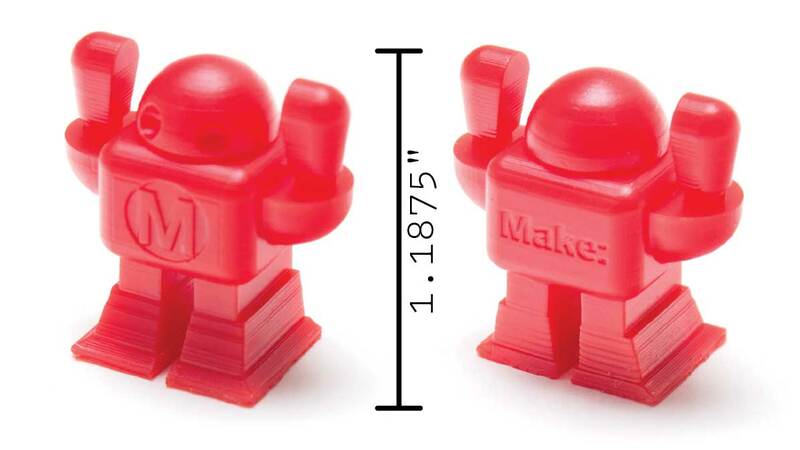 To further test fine detail, we printed a batch of robots at 0.35 scale; while the logos were light at that tiny size, most were still visible. Capable of extremely small details, the B9 Creator produced the finest prints of any machine we tested. The software is fluid and responsive, with powerful configuration options. If you need professional-grade printing and are willing to spend time calibrating and experimenting, you’ll be well-served by this machine. The B9’s software for manually adding support is slick, and you can use it for your FFF printer too. Export an STL and use NetFabb to trim any protrusions on the bottom; just set the position to 0mm and slice it flush. Watch the Getting Started videos before setting up. The documentation isn’t well organized. The cherry resin can be tricky to use; for settings, check out B9 community member “CarterTG”. 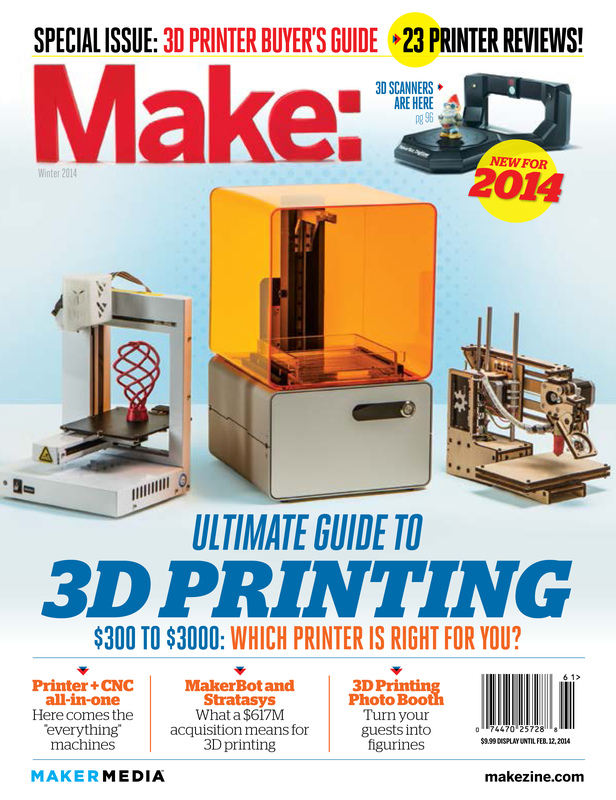 This review first appeared in MAKE’s Ultimate Guide to 3D Printing 2014, page 93. Check out the full issue for more!